Ontario – “To be a father is a lifetime responsibility. You aren’t living on your own anymore. You are living a life which is also connected to your other family members. 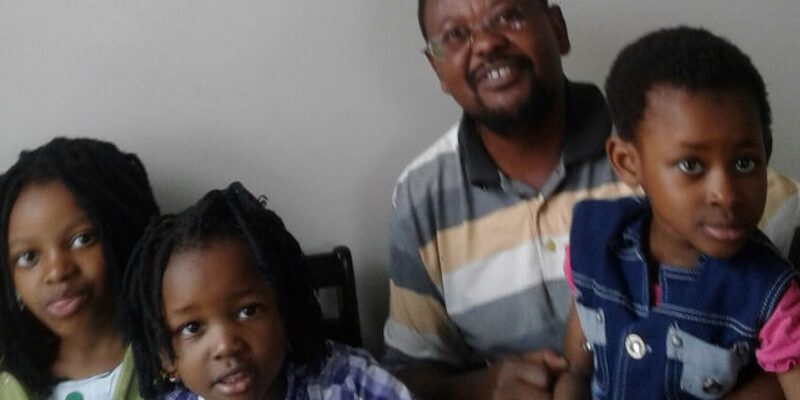 Especially when you have a family member with a special need, the responsibility is even much higher,” says David Bulambo a former Congolese refugee who was resettled in Canada last month with his three daughters – two of whom have special needs. David left his home country, the Democratic Republic of Congo (DRC), in 1996. At the time, he was on his own, only fleeing a conflict that killed millions including four of his family members. David thought he may return to DRC, but two decades later, the situation never improved and David was still a refugee. The first half of the two decades, David was on his own trying to survive what he calls “the toughest life” in Kakuma refugee camp, 120 km from the border of South Sudan. Entering a refugee camp is a life-disrupting experience. You are isolated from the world and live dependent on assistance. Hope is completely lost at that point. Life in the camp remained dire until Jesuit Refugee Service (JRS) started a scholarship program at Kakuma camp and David was one of the first to apply. He says the day he was accepted for the scholarship was the day he was offered another opportunity in life. He knew education would be his only way out of the camp and he was right. After completing his first degree in communication and language studies in 2008, he secured another opportunity to go to Nairobi and persue his second degree. “JRS was the foundation to getting a higher education and to all that came after,” says David. Things for David got even more difficult when his second daughter began exhibiting the same symptoms and was eventually also diagnosed with autism, and his wife began suffering from severe depression. Schools would reject his daughters, experts were too expensive to afford, and he took on all of the household burdens. David’s love for his family never changed and only grew stronger. Then, David received word that he would be resettled with his family in Hamilton, Ontario in Canada – a place where there are available resources for his children and wife. “In Canada, there is hope,” David said. Only a month into his new life, David has already approached schools who will accept his daughters and found support for their special needs. David says he owes this hope to the education he received as a refugee. “Education has a potential to open one’s life. It is what gave me back mine.” His education was fundamental to his ability to process the world around him, even when things were very challenging. And David’s education is now giving him a leg up in transitioning to a new life and in being a father. Fathers should not lose hope. We need to be persistent in taking care of our children, because their tomorrow depends on what they are given.